Wi-fi smart plugs are practically a dime a dozen these days, right? Part of me thinks that there's just one factory located in Southeast Asia manufacturing all of these things, that they then ship off to various companies who program them to respond to their proprietary app, etch a brand logo on them and then resell them to the consumer. What I'm saying is, aside from the app being used to control the plug, there isn't much physical difference in wi-fi smart plugs. Every so often, a company will throw in a few extra features and see if they stick. Enter the Geeni Switch + Charge Wi-fi Outlet. What it is and what it does is obvious. It's a wi-fi smart plug that you can command through Google Home or Amazon Alexa. In addition to that, the Geeni Switch is also boasts two USB ports that can be used to charge any number of your compatible devices. This little plug is perfect to put near your nightstand. You can plug a lamp into the outlet and then use the two USB ports to charge your phone and tablet overnight. Problem is, if your device supports Quick Charge, you won't be quick charging from these USB ports. People tend to mis-read the information provided by Geeni regarding it's USB ports on the Geeni Switch + Charge Wi-fi Outlet. In order to support Quick Charge, a USB port has to be capable of delivering 2 amps. Many people who buy the Geeni Switch + Charge think that each USB port on the switch charges at 2 amps. That's not the case. Each USB port charges at 1 amp, so two 1 amp USB ports equals 2 amps. 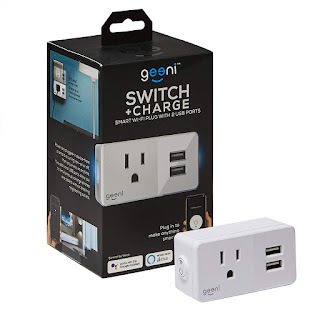 For that fuzzy math to work out to a Quick Charge rating, the Geeni Switch + Charge would have to claim a total of 4 ams (Two 2 amp USB ports = a total of 4 amps on the device). The USB ports are always on as well, you cannot shut them off via the app. Neither those things were deal breakers for me. Overall, the Geeni Switch + Charge Wi-fi Smart Outlet has been a fine addition to my smart home deployment. At a cost of around $15, you get reliable, easy to install, easy to manage smart plug that just happens to boast two USB charging ports.